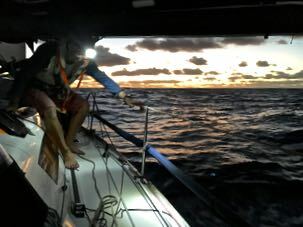 We left Niue on the 29th of May at night. The night sailing was very pleasant with a clear sky full of stars in a perfect downwind and pleasant swells. The day after we flew the spinnaker sailing in 0,5 - 1 knots more speed. The proper date line is 180 degrees, however it passes right through the island of Taveuni which is in Fiji. Long time ago Fiji was an island divided into yesterday and tomorrow, which means a country with the same time, however 2 different days! 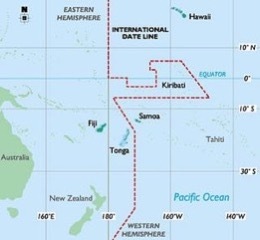 Nowadays the date line has moved for a few countries such as Fiji making it easier for them. Others countries such as Tonga, Karibati and nowadays Samoa (this map is dated before the year 2000 as Samoa managed to move the date line just before the millennium wanting to be one of the first countries to enter the next millennium!) have managed to be on the other side of their official date line. 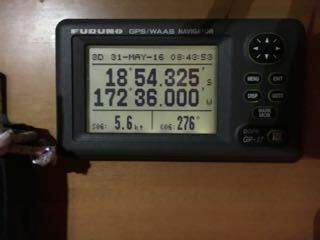 On the 30th of May at 21h45 we passed the date line at 172.36 W passing directly to the 1st of June in a second! We had just lost the entire day of 31st of May. This day will forever be an empty page in our calendar. 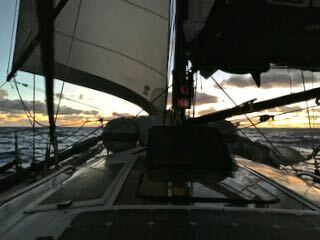 By this time we had taken down the spinnaker and sailed by the jib as a butterfly. We experienced yet another lovely night sailing. The day after at 8.00 am the jib got loose as the sheet to the spinnaker bom snatched being shafed by the bom. We decided to fly the spinnaker again. At 10.00 am we had Tonga in sight!